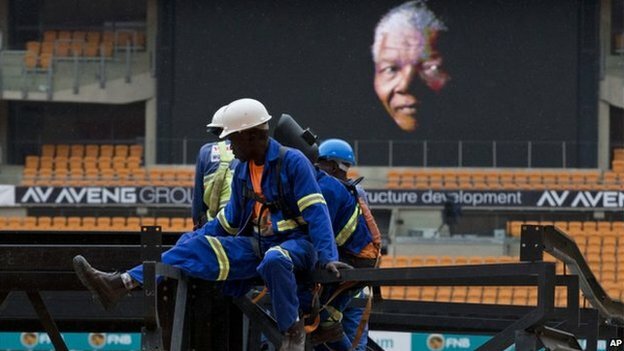 The service will be held at the 90,000 capacity FNB stadium, where Mr Mandela made his last public appearance. It will also be shown on big screens at three “overflow” stadiums. The former South African president died aged 95 last Thursday. 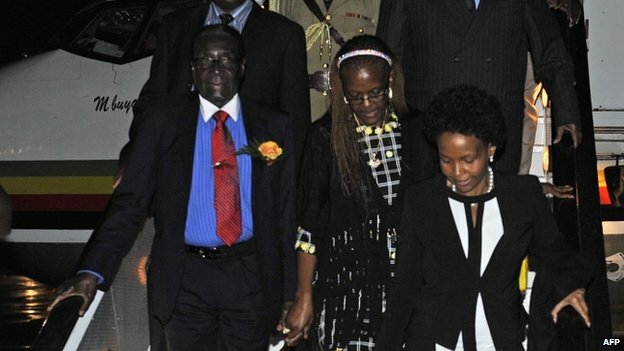 The country is observing a series of commemorations leading up to the funeral on Sunday. The memorial service is likely to be one of the biggest gatherings of international dignitaries in recent years. Hundreds of people began assembling outside the stadium during the night, the BBC’s Joe Winter reports from the scene. Crowds, many wearing Nelson Mandela t-shirts and South African football and rugby tops, are singing songs from the fight against apartheid, our correspondent adds. The crowds will be addressed by South African President Jacob Zuma and there will be tributes from other heads of state, including US President Barack Obama, Brazilian President Dilma Rousseff and Cuban President Raul Castro. Under Mr Castro’s brother Fidel, Cuba was a staunch critic of apartheid, and Mr Mandela had expressed gratitude for his support. Four of Mr Mandela’s grandchildren are also expected to make speeches, along with Andrew Mlangeni, Mr Mandela’s fellow former Robben Island prisoner and friend. The UN Secretary General Ban Ki-moon, who will also pay tribute as part of the service, visited The Nelson Mandela Centre of Memory in Johannesburg on Monday. “The world mourns the loss of Nelson Mandela, one of the towering figures of our time and indeed of any time,” he said. British Prime Minister David Cameron will be among those attending Tuesday’s memorial. Deputy Prime Minister Nick Clegg and Labour leader Ed Miliband will also attend, along with former British Prime Ministers Gordon Brown, Tony Blair and John Major. Francois Hollande of France, Palestinian leader Mahmoud Abbas and India’s President Pranab Mukherjee are also on the list, as well as Zimbabwe’s President Robert Mugabe. Leading celebrities in the anti-apartheid movement Peter Gabriel and Bono are expected to attend. 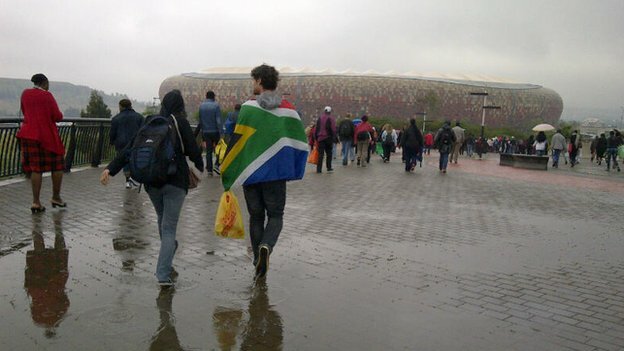 They will join a 95,000-strong crowd at FNB stadium, also know as Soccer City, just outside Johannesburg, near Soweto. Mr Mandela made his final major public appearance there during the 2010 football World Cup. The memorial service is due to start at 11:00 (09:00 GMT) and is expected to last four hours,according to the official programme. 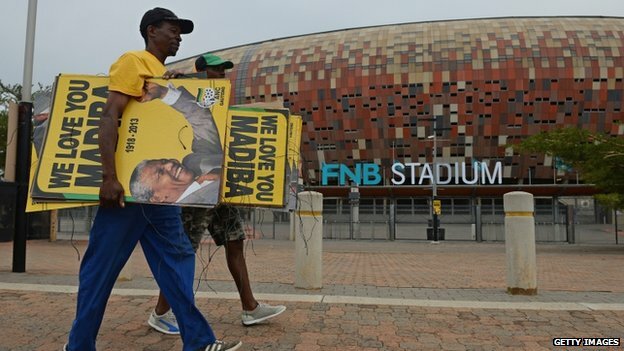 People camped out around the stadium overnight on Monday to be sure of getting a place inside, the BBC’s Diplomatic Correspondent James Robbins reports from Johannesburg. But because public seating is not ticketed, the South African authorities are certain many people will have to be turned away, our correspondent adds. The service will be shown on big screens at three “overflow” stadiums – Orlando, Dobsonville and Rand – as well as at community venues around the country. Mr Mandela’s body will lie in state in Pretoria on the following three days and a state funeral takes place on Sunday in his home village of Qunu in Eastern Cape province. Two of Mr Mandela’s granddaughters, Tukwini Mandelaand Nandi Mandelaorking, told the BBC the family had been working to give him “the beautiful send-off that he deserves”. More than 100 current or former heads of state or government will attend the funeral or the national memorial, according to the South African government. 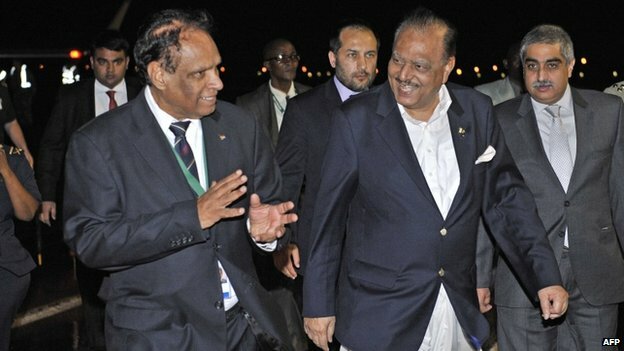 The foreign ministry said on Monday that 91 current heads of state or government had confirmed they are coming to South Africa, along with “10 former heads of state, 86 heads of delegations and 75 eminent persons”. Among those not attending the memorial events will be Israel’s Prime Minister Benjamin Netanyahu, who cited high travel and security costs. However there will be suspicion that he wishes avoid the potential for anti-Israeli protests, the BBC’s Middle East Correspondent Kevin Connolly reports. Israel had extensive links with the old apartheid regime and many South Africans identify strongly with the Palestinian cause, our correspondent adds. Israeli President Shimon Peres is not attending due to illness, so Knesset speaker Yuli Edelstein will represent the country. The Dalai Lama will also be among the notable absentees, after twice failing to get a visa to South Africa. (Reuters) – President Barack Obama on Saturday defended an interim deal with Iran to curb its nuclear program and, seeking to reassure Israel, pledged to step up sanctions or prepare for a potential military strike if Tehran fails to abide by the pact. U.S. relations with Israel have been strained by the interim agreement, reached between Iran and major world powers including the United States, which was designed to halt advances in Iran’s nuclear program and buy time for negotiations on a final settlement. The United States says the agreement will give the international community time to see if Tehran is serious about curbing its nuclear ambitions, while providing some relief from sanctions that have crippled its economy. Obama, speaking at forum hosted by Haim Saban, a major political donor, made a point of referring to Netanyahu as “my friend Bibi,” while acknowledging they occasionally had “significant tactical” disagreements. Obama said the interim deal, negotiated with Iran by the United States, China, Russia, Britain, France and Germany, would provide space for a longer-ranging agreement to curb Iran’s nuclear ambitions, which Tehran says are peaceful. The president said he viewed the likelihood of a satisfactory “end state” as a 50/50 proposition, and repeated that all options remained on the table if Iran did not follow through with its obligations. “If we cannot get the kind of comprehensive end state that satisfies us and the world community … then the pressure that we’ve been applying on them and the options that I have made clear I can avail myself of, including a military option, is one that we would consider and prepare for,” he said. Obama said it was unrealistic to believe that Iran would halt and dismantle its nuclear program if the sanctions regime were strengthened and talks were not given a chance to succeed. “One can envision an ideal world in which Iran said, ‘We’ll destroy every element and facility and you name it, it’s all gone.’ I can envision a world which Congress passed every one of my bills that I put forward. I mean, there are a lot of things that I can envision that would be wonderful,” he said to laughter from the audience. Israeli Strategic Affairs Minister Yuval Steinitz, in reaction to Obama’s remarks, said the two countries needed to resolve their differences on the issue. “It must be made clear: In the final agreement, Iran must not have the capability to produce nuclear weapons. In order to ensure this, Iran must not have any capability to enrich uranium or to produce plutonium,” Steinitz said. Obama suggested any enrichment capacity left in Iran would be limited. “It is my strong belief that we can envision an end state that gives us an assurance that even if they have some modest enrichment capability, it is so constrained and the inspections are so intrusive that they, as a practical matter, do not have breakout capacity,” he said. The United States says it will confer closely with Israel about crafting a permanent Iran agreement after the six-month confidence-building period laid out by the Geneva deal. While pursuing that path, Washington has sought to reinforce its commitment to protecting Israel. “We will not abide by any threats to our friends and allies in the region, and we’ve made that perfectly clear. And our commitment to Israel’s security is sacrosanct,” Obama said. Secretary of State John Kerry, who spoke at the forum later in the day, said disagreements with Iran would continue on issues including Tehran’s support for Lebanese Hezbollah, which the United States deems a “terrorist” group, and for Syrian President Bashar al-Assad. Although the discussion at the Washington-based Brookings Institution focused primarily on Iran, Obama also touched on the Middle East peace process aimed at ending conflict between Israelis and Palestinians. That in effect set the end of April 2014 as a deadline, although U.S. officials have said that was not hard and fast. “I think it is possible over the next several months to arrive at a framework that does not address every single detail but gets us to a point where everybody recognizes (it’s) better to move forward than move backwards,” Obama said. In their remarks, both Obama and Kerry made clear that if a framework agreement were reached next year, there would still be more work to do. Obama said the outlines of a potential peace agreement were clear and he left the door open for a pact that excluded the Gaza Strip, which is now controlled by Hamas Islamists opposed to peace moves by Palestinian President Mahmoud Abbas, who controls the West Bank. “If there is a model where young Palestinians in Gaza are looking and seeing that in the West Bank, Palestinians are able to live in dignity … that’s something that the young people of Gaza are going to want,” Obama said. Like many people around the world, I came to know of Nelson Mandela from a distance, when he was imprisoned on Robben Island. To so many of us, he was more than just a man – he was a symbol of the struggle for justice, equality, and dignity in South Africa and around the globe. His sacrifice was so great that it called upon people everywhere to do what they could on behalf of human progress. In the most modest of ways, I was one of those people who tried to answer his call. The first time that I became politically active was during my college years, when I joined a campaign on behalf of divestment, and the effort to end apartheid in South Africa. None of the personal obstacles that I faced as a young man could compare to what the victims of apartheid experienced every day, and I could only imagine the courage that had led Mandela to occupy that prison cell for so many years. But his example helped awaken me to the wider world, and the obligation that we all have to stand up for what is right. Through his choices, Mandela made it clear that we did not have to accept the world as it is – that we could do our part to seek the world as it should be. Over the years, I continued to watch Nelson Mandela with a sense of admiration and humility, inspired by the sense of possibility that his own life demonstrated and awed by the sacrifices necessary to achieve his dream of justice and equality. Indeed, his life tells a story that stands in direct opposition to the cynicism and hopelessness that so often afflicts our world. A prisoner became a free man; a liberation figure became a passionate voice for reconciliation; a party leader became a president who advanced democracy and development. Out of formal office, Mandela continued to work for equality, opportunity and human dignity. He has done so much to change his country, and the world, that it is hard to imagine the history of the last several decades without him. A little more than two decades after I made my first foray into political life and the divestment movement as a college student in California, I stood in Mandela’s former cell in Robben Island. I was a newly elected United States senator. By then, the cell had been transformed from a prison to a monument to the sacrifice that was made by so many on behalf of South Africa’s peaceful transformation. Standing there in that cell, I tried to transport myself back to those days when President Mandela was still Prisoner 466/64 – a time when the success of his struggle was by no means a certainty. I tried to imagine Mandela – the legend who had changed history – as Mandela the man who had sacrificed so much for change. The story told by Mandela’s life is not one of infallible human beings and inevitable triumph. It is the story of a man who was willing to risk his own life for what he believed in, and who worked hard to lead the kind of life that would make the world a better place. In the end, that is Mandela’s message to each of us. All of us face days when it can seem like change is hard – days when our opposition and our own imperfections may tempt us to take an easier path that avoids our responsibilities to one another. Mandela faced those days as well. But even when little sunlight shined into that Robben Island cell, he could see a better future – one worthy of sacrifice. Even when faced with the temptation to seek revenge, he saw the need for reconciliation, and the triumph of principle over mere power. Even when he had earned his rest, he still sought to inspire his fellow men and women to service. Prior to my election as president of the United States, I had the great privilege of meeting Mandela, and since taking office I have spoken with him occasionally by phone. The conversations are usually brief – he was in the twilight of his years, and I am faced with the busy schedule that comes with my office. But always, in those conversations, there were moments when the kindness, and generosity, and wisdom of the man shone through. Those are the moments when I was reminded that underneath the history that has been made, there was a human being who chose hope over fear – progress over the prisons of the past. And I was reminded that even as he became a legend, to know the man – Nelson Mandela – was to respect him even more. President Barack Obama, who has backed a Senate measure to increase the minimum to $10.10, specifically mentioned fast-food workers “who work their tails off and are still living at or barely above poverty”, in an economic policy speech on Wednesday. His Democratic allies, who control the upper chamber of Congress, have said a vote on the matter could be held this month. But even if it passes the Senate, it is not clear if it would be approved by the Republican-led House of Representatives. 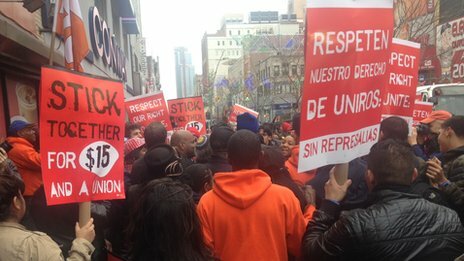 Nearly 100 protestors gathered around a Wendy’s restaurant in Brooklyn, New York, at midday, carrying signs saying “stick together for $15/hr”. Shaquena Davis told the BBC she worked at the fast-food restaurant, making $7.25. Kachelle Krump, 23, works at a Burger King in the area. She told the BBC she works 16 to 20 hours a week and would like more hours, but that management had been unhelpful. “I have a child who is seven years old – she’s in school, she needs things,” said Ms Krump. 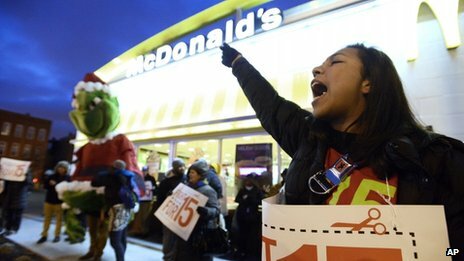 In Detroit, about 50 demonstrators turned out for an early morning rally in front of a McDonald’s, including a handful of employees who walked off the job. However, the restaurant stayed open. Another 40 demonstrators rallied at a Burger King in Atlanta. The American fast-food industry has come under increasing scrutiny because part-time jobs, including retail and food positions, have made up most of the job growth since the recession. It is not yet clear how many fast-food restaurants will be affected by Thursday’s industrial action. The workers’ last nationwide strike, in August, was patchy, with some restaurants appearing to function normally while others were unable to do business. 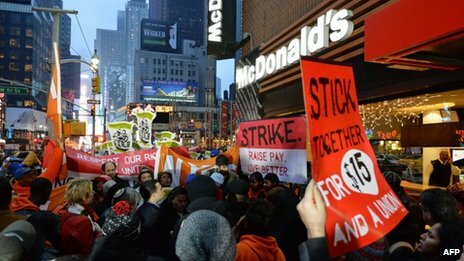 The National Restaurant Association, an industry lobbying group, called the strikes a “campaign engineered by national labour groups”, claiming the vast majority of participants were in fact union protestors. The association said firms already face “great uncertainty”. This week, a measure in the tiny airport town of SeaTac, Washington state, to raise the minimum wage to $15 per hour passed by 77 votes. As a result, some 6,300 workers at SeaTac’s airport, which primarily serves the region’s largest city, Seattle, will be paid the highest minimum wage in the nation. However, Alaska Airlines, the airport’s biggest airline, has sued to block the measure. Regardless, union organisers in SeaTac said they were hoping the success of their vote would inspire workers protesting around the nation. “What we need is a social movement in this country that says enough is enough,” said David Rolf, the president of the local Service Employees International Union.